In 2001, R.W. Griffin and Engelhard Chemical, one of the largest chemical companies in the world (now owned by BASF) entered into a long term exclusive distributorship for BASF’s 19-E fertilizer produced around the clock at Attapulgus, Georgia. R.W. Griffin’s ability to win a very sought after contract with BASF was based on its’ ability and commitment to provide significant storage and logistical assistance for BASF’s product. 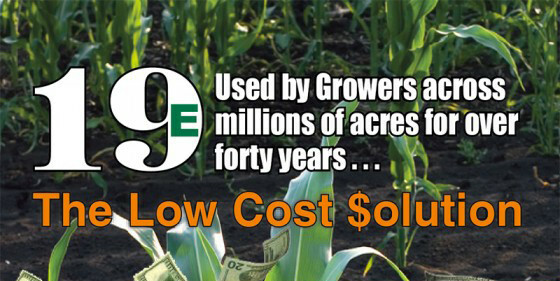 19-E is a popular product for our Southeast farmers providing them needed inputs at a very reasonably priced cost. Farmers have been using the product with success for almost 40 years. No risk of potential N loss due to volatilization. Specialists suggest about 200 lbs of NITROGEN for 150 bu/a corn and about 275 lbs for 200 bu/a corn. 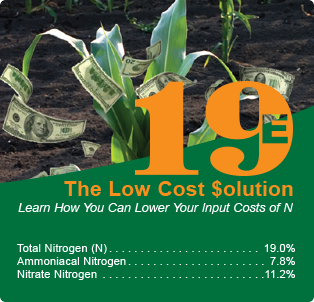 For higher yields, consider 1.2 lbs of N for every bushel of expected corn grain yield. Split apply N for corn with 50-75 lbs applied preplant and the remainder split at 12″ ht. and then several times through the pivot. An 8 ton/a yield of bermuda needs at least 400 lbs/a each of N and of K20. Hay responds well to 75 lbs/a of N applied pre-1st cut and then 100 lbs/a of N applied right after each cutting. POTASSIUM and SULFUR are essential for efficient crop use of N. 16-0-5 (a mix of 19-E and soluble potash) helps to provide a part of the crop’s K needs. For years my cotton growers have benefitted when I mix soluble potash and ammonium thiosulfate with 19E to produce a 14-0-4-2s. This prevents N loss by volatilization, provides a uniform application and eliminates the risk of leaf burn. Nitrate and ammonium N sources are equally effective when each is properly applied and at the same rate of Nitrogen.